It will certainly one day become evident, if it is not already the case, that photography’s claim on objectivity, as an index to the “real”, was nothing but an anormaly, a growing pain in the history of the medium’s legitimisation process. For Edwin Zwakman, the justification of constructed photography is no longer dependent on its subtle fractures with “photographic evidence”. That critical front, initiated over 30 years ago in conceptual photographic practises and finally synthesized and popularised in the large scale photographs of Cindy Sherman and Jeff Wall, has run its historical course. For Zwackman and other young photographers emerging in the digital age, there is an absolute acceptance of the constructed image at every level of cultural production, and a celebration of its visual effects over claims to its genealogy with the “real”. Zwakman pulls his camera back to reveal the lights and stagecraft behins his elaborate sets, not out of a self-conscious modernist disposition, but to demonstrate the absolute equivalence between the scene depicted by the the maquette and the instrumentality of the photographic act the business of the constructed image as usual. 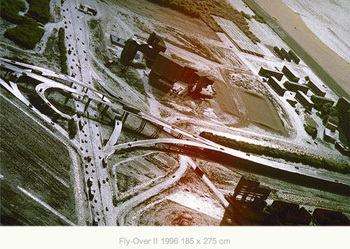 What is unique to Zwakman’s photographs is the way in which his laborious construction methodology re-enacts the overdetemined environmental design processes particular to the Dutch landscape he depicts. It is this doubly constructed effect that give his images their critical edge. The residue of utopian modernist ideals that permeate the sujects of his photographs are slowly and critically undone through their obsessive reconstruction as images. 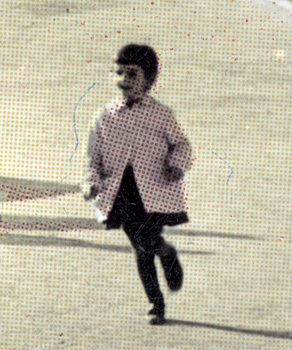 The problematic inherent in the effect of Zwakman’s laborious production method is that it solicits a slow and allegorically paced reading that may no longer be ready accessible in a globally modelled universe immersed in fast image turnovers and the depreciation of the complex layered languages bases of cultural specificity. 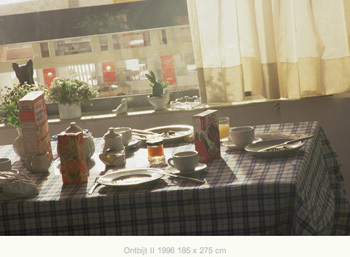 In this regard, his photographs are resistant to the constructed photographic methodology of advertising. In response, they register a desire for a symetry between the labor of artisitc production and the labor of receivership. 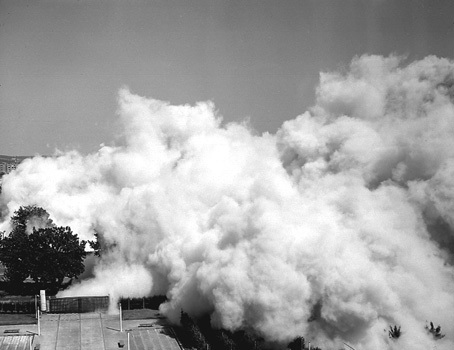 “Time”, with all its false starts, delays and expenditures, is their ultimate subjects. For both Zwakman and his viewers no stone should be left unturned. 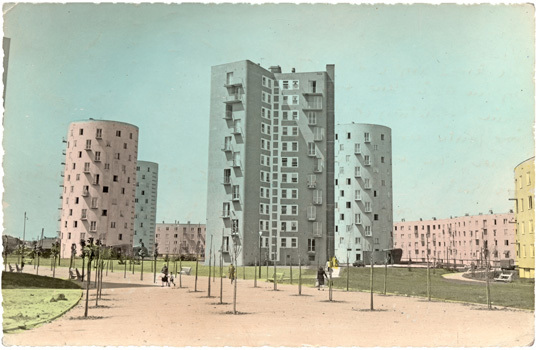 Le grand ensemble renvoie à la fois à l’architecture des quartiers d’habitat social construits en périphérie des villes françaises entre 1950 et 1970, et au travail de l’artiste à partir de cartes postales, d’agrandissements de quelques-uns des personnages qui y apparaissent et de photographies d’implosions d’immeubles. Il invite à repenser de façon poétique cet urbanisme qui, avant d’être stigmatisé, symbolisa la modernité technique et le progrès social. La vision fantasmée véhiculée par les cartes postales laisse peu à peu la place aux images violentes de démolition faisant table rase de l’histoire des habitants de ces quartiers. Devenus des silhouettes imprécises surgies de la trame des images, ceux-ci demeurent la mémoire de cinquante ans d’histoire urbaine, entre la promesse du meilleur des mondes et la fin d’une utopie. Un catalogue des œuvres de Mathieu Pernot autour du Grand Ensemble paraît en mars 2007 aux éditions Le Point du Jour (Cherbourg-Octeville). 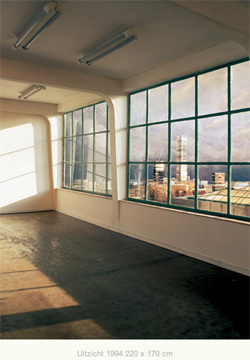 Soleritown is a photo reportage project of the Architecture of Paolo Soleri (Turin, 1919). Conceived by the cultural association plug_in, it is also supported by the Cultural Institute of the Province of Turin and Fondazione Ordine Architetti PPC in Turin. 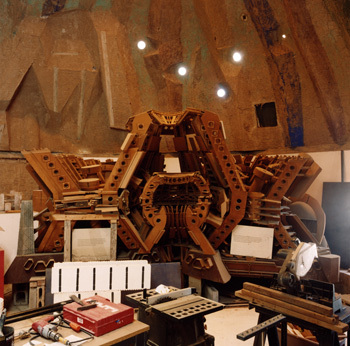 For the first time, the American works of Paolo Soleri are represented in the photographs of two Italian photographers : Emanuele Piccardo and Filippo Romano. 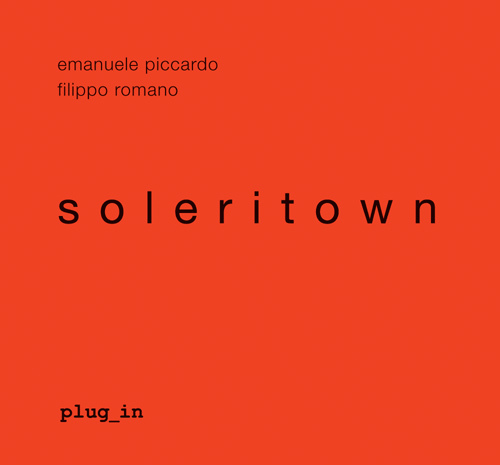 Soleritown is a visual and critical reflection of the idea of « city » as expressed by Paolo Soleri in the two city fragments, Arcosanti e Cosanti, located in the desert of Arizona. The arcology, a concept synthesized from the union between architecture and ecology, has been Soleri’s central idea since the 1950’s, starting from tabula rasa with the shapes and typology in the desert. The photographs are a tool to see and critically analyze these places. In turn, these images are part of new iconography that is itself connected to the tradition of American photography. 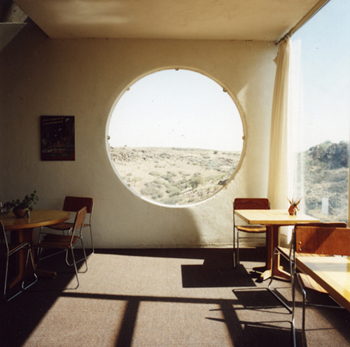 Arcosanti and Cosanti are two places that have been represented only in sketches and models. From this gap, arises the idea of giving actual visual representation to Paolo Soleri’s architecture and work.